This past weekend the four of us shot up Rt. 16 to the White Mountains of New Hampshire to play some rock for the fine patrons at The Red Parka Pub in Glen, NH and then the next night at The Barley Pub in Dover. Colin and I made it up the night before to hang and hopefully ski the next day. Our buddy Tommeeee was the man of honor this weekend. We all celebrated his birthday at a sweet cabin in the woods that we crashed for the weekend. The cabin crew had a late night Thursday night, then awoke to crazy cold temperatures and high winds Friday morning. Colin and I made the call that skiing would not be fun under these conditions, so we joined the rest of the crew in a quest to find Ebenezer’s in Lovell, Maine. 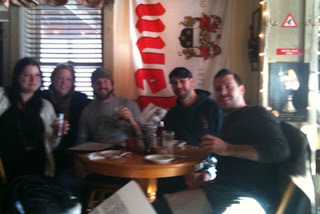 Our buds Tommy and TJ are brewers for Cape Ann Brewery, purveyors of the fine line of Fisherman’s Brews. Their whole existence revolves around making and enjoying the finest beers the world has to offer. Today that quest took them on a trip to find the famous Ebenezer’s Restaurant and Pub. After a drive through the rural roads of NH and Maine, we found this little oasis of beer perfection at the end of a random winding road. The crew of six of us walked in and the needle scratched across the record. The locals all turned and looked at us like, “Who the fu..?” Eventually, Chris emerged from the back room and greeted us. We pulled up some seats, and began to peruse the beer menu. It should be noted that the attraction to this modest looking bar in the middle of the woods is that the proprietor, Chris, is owner of what has been voted the best beer collection in the entire world. No lie, he has won awards year after year from beer geek magazines as having the best beer collection in the world. Geez, I hope he shares with his friends. Actually he does. After hanging out for a little while and tipping back our first pint, the Fisherman’s boys introduced themselves and struck up some beer talk with Chris and his bar hand, Hannah. They quickly spiraled off into a beer conversation that I couldn’t process. They were using terms like chlorophenolic, balling degrees and trub. I just sort of glazed over and started sipping my pint. Anyway, this is a band blog, right? So, after Ebenezer’s, we shot back to the Granite State. Colin and I parted with the cabin crew and met up with Max and Mike over at The Red Parka. 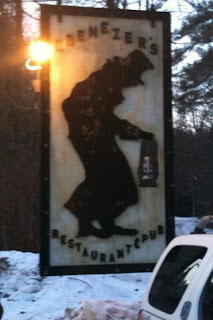 The Parka is an ultra cool après-ski pub near Attitash and Wildcat. They have a devoted following of skiers and riders, and the vibe is everything you would hope for in a ski bar. The whole room is post and beam, and at one end is a perfect stage with an easy load in. We set up, ate some delicious food and jumped on stage. We had 3 sets planned for the evening. Babz and the staff treated us like kings from the moment we arrived. We were all feeling great. We played a relatively tame first set since the dinner crowd was still lingering a bit. We could feel a great vibe brewing in the room during that first set, and people were already getting fired up. We got huge responses for some of our new originals like Work From Home as well as Tuesday Night. We had a great stage mix going taboot… everything seemed right on. We finished up the first set and threw on some Willie Nelson during the set break. With “Night Life” caressing the ears of our crowd, we slipped out the back door of the stage to get some air. Outside it was bitter bitter cold and the wind was whipping. We said, imagine how cold it is on top of Mt. Washington right now… probably 50 below! The trees blew violently in the gusts. We could feel our ears getting numb. As the time came to hit the stage for set 2, we were completely primed and ready for the night to take off. We had saved all of our best stuff for the late night sets. Mentally, we were all on the same page. We get to step onto the bandstand to a full room, and immediately start playing. All of our friends from the cabin were in the crowd and feeling rowdy. It was perfect. So we open the door to the stage and walk into a room of complete darkness. Huh?! Yup, those wicked winds had blown the power out. The room was dark and you can bet our amps were off. With no acoustic instruments in tow, we were without the ability to make noise. We hung in there as long as we could with no power, but the bar eventually declared that they were closed, and people reluctantly made their way towards the door. I think I met a guy named Buzz Killington as we were packing up in the dark. The power eventually came back on when we were back at the cabin. The next night at The Barley Pub was a little better as a whole. At least the power stayed on the whole night. ;) Them’s the breaks, I suppose. Live free or die. In the words of Willie… The night life… ain't a good life… but its my life. On Cape for the weekend... kid! Playing Cape Cod in the off-season is quite an experience. 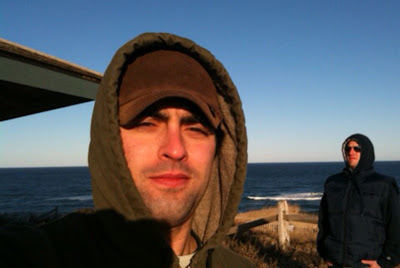 hi8us spent the weekend of Jan 22 -23 down Cape playing and chilling out. Friday night we hit Tommy Doyle’s in Hyannis and opened up for Tripl3Crown, the local 3-piece headliner. The crowd was pretty thin the whole night, but we all had a blast. We were pretty happy with our set, and loved Tripl3Crown’s set as well. The dudes in the band were on the level, and we all hung out for each other’s sets. They have great original material, and totally nailed their cover of Edgar Winter’s Frankenstein. It was excellent. After the gig Friday we shot to Orleans where we were playing The Land Ho! the next night. We set up camp at The Olde Tavern Inn where we always stay when we play “The Ho.” Brandon, the owner, was there late-night to check us in for our two-night stay. He knows us by now, and we all caught up a bit. The next morning we ventured down Cape to P-town for some sightseeing. On the way we stopped off at a bunch of beaches and scenic spots to take in the off-season solitude of the outer Cape during these winter months. It was cold as a mother that morning, but the sky was clear blue, and the clean ocean air was perfect for awakening the senses after a long night. We hit JoMama’s for coffee, then Coast Guard Beach and then The Marconi Site. The Marconi Site marks the location of the first transatlantic radio signal to be sent from the US across the Atlantic. The year was 1903, and it was right around this time of year. We were late by about 107 years to the day to witness this feat first hand. ;) My dad used to always trek the family to The Marconi Site when I was little and on vacation on the Cape. Also, my dad can send 20+ words a minute in Morse code, which is the Morse code equivalent of being able to run a sub 5-minute mile. Yeah Pop! We arrived in P-town, and had some lunch at a place on the main drag. I had been talking about lobster bisque earlier, and it was the soup of the day, so I went for it… and it was good. That night we set up at The Ho and played to a surprisingly packed, lively, room. 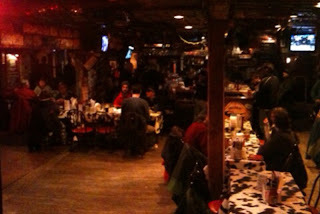 The night was a ton of fun, and we raged The Olde Tavern for a second night after the show. We had a few Cape fans that made the weekend run of hi8us shows, so we were psyched about it. Highlight hi8us fan sightings were our old friends Joe Mullet and Jamie. Good times on the Cape, pal! C-ya!